Planetary Science missions, past, current, in planning or in development, extend mankind’s presence to the solar system’s inner rocky worlds, helping to unlock the secrets of the solar systems’ composition, history and evolution, and how life established itself on Earth. Mercury is the least explored terrestrial or “rocky” planet in our solar system. Previously NASA’s only encounters with the innermost planet were the three flybys performed in 1974 and 1975 by the Mariner 10 mission that mapped 45 percent of the planet’s surface. 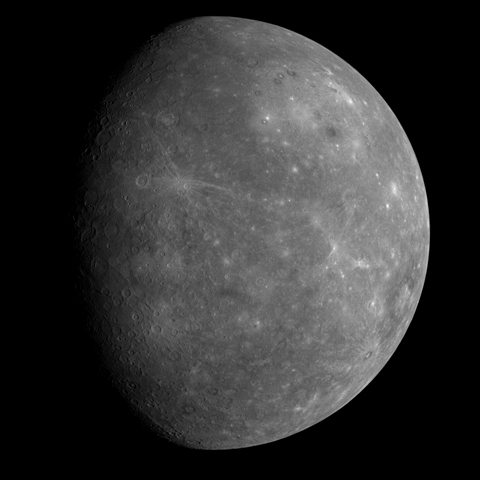 In January 2008, the MESSENGER spacecraft flew by Mercury for its first of three fly-bys. As it begins to reveal the planet’s composition and history, it will in turn, help scientists understand more about our home planet and its place in the inner solar system. Venus has often been described as Earth’s sister planet since the two are very similar in size and bulk composition, although they evolved to very different ends. Venus is not currently targeted by any NASA missions although future mission concepts include the Venus In Situ Explorer (VISE) and Venus Mobile Explorer (VME) that would investigate the surface of Venus and help understand the climate change processes that led to the extreme conditions of Venus today. A Venus Surface Sample Return (VSSR) mission is also being considered. These missions remain long-range goals for Venus exploration. Earth’s Moon has a special place among the objects of the solar system, as it is the only body other than Earth where humans have journeyed to and where humans will return relatively soon. NASA is sending robotic missions to the moon to prepare for mans’ prolonged habitation on the lunar surface which ultimately will help man reach for Mars and attain the goals set forth in the Vision for Space Exploration (VSE). Studying the Moon and its history provides insight on the formation history of the Earth-Moon system and events that shaped the inner solar system. Mars is a highly attractive object of study: not only does it provide an excellent laboratory for studying planetary evolution in the context of the Earth and Venus, but it is the most compelling target in the solar system to search for life’s existence beyond Earth. Additionally, Mars is an eventual goal of the Vision for Space Exploration’s human spaceflight program. Finally, Mars is relatively easily accessed with launch opportunities occurring approximately every 2 years. For these reasons, the Mars Exploration Program is a fully integrated program, designed to maximize the scientific return, technology infusion, and public engagement of the robotic exploration of the Red Planet. Each strategic mission of the program has both technological and scientific linkages to previous missions and orbiters, and landers support each other’s operations.